The Enterprise is chasing a vessel of the mysterious Ferengi, who may have stolen some energy doohickey. The chase takes them to a star system, and the Ferengi ship seems to have a weapon that is draining all the Enterprise’s power. 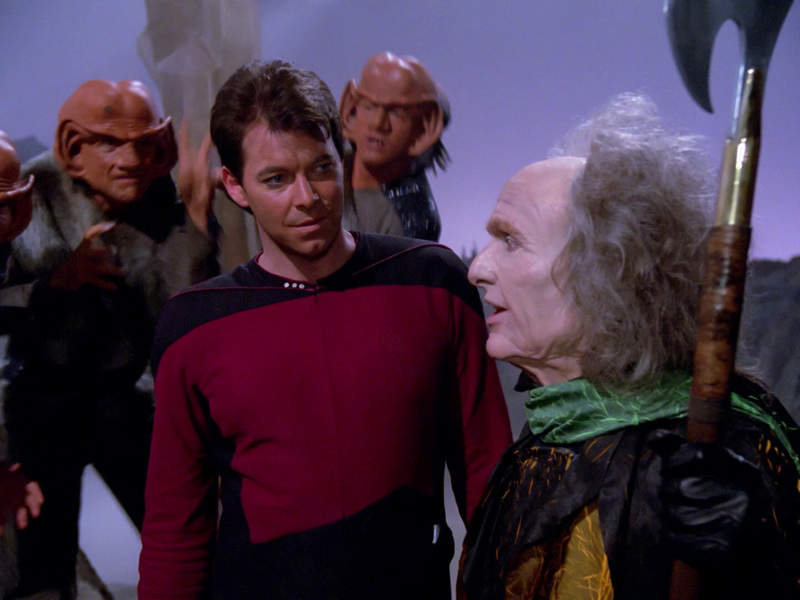 Picard contacts the Ferengi to surrender — second surrender in the first four episodes! — and learns the Ferengi are being affected in the same way. The two ships determine something on the planet’s to blame, so they beam down away teams. After Riker and Co., are assaulted by the Ferengi, an automated ‘portal’ left behind on the planet from the long-dead Tkon Empire appears to pass judgment. Riker uses some Kirk-style verbal tricks to impress the portal (yawn), saving the away team and the ship (which was about dead in orbit). Riker also asks the portal to spare the Ferengi, which he does. Well, the Ferengi were supposed to be TNG’s big enemies. They’re mentioned in “Encounter at Farpoint”, and Picard implies that they’ve been known to eat their past business associates. 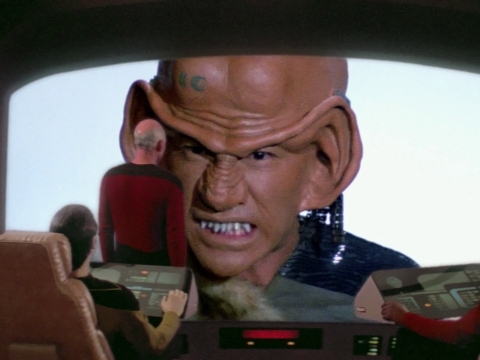 Of course, the Ferengi we see in this episode are far from intimidating. They’re really just incredibly annoying. Essentially, the creators gave themselves a mulligan on the Ferengi — an alien race they clearly spent time developing but one that didn’t work out. In the first and second seasons, the Ferengi are made out to be adversaries on par with the Romulans, Klingons — and later, the Cardassians and the Breen. But by season three, they’re not seen as a major threat. They’re really just a nuisance. When the Dominion War breaks out in the latter seasons of DS9, the Ferengi Alliance doesn’t rank as high as the other Alpha Quadrant powers and doesn’t appear to get involved in the war. It’s been said that early TNG isn’t just bad TNG. It’s more like bad TOS. This episode could have fit right into the original series, with Riker playing the part of Kirk on the surface, leading the fight scenes against the bad guys. Picard, on the ship, plays the part of Scotty. Later in TNG, the roles are reversed, with Picard and Data taking on the Kirk/Spock roles and Riker often left behind to mind the store. In some ways, this change helped make TNG a better series — but the marginalization of Riker gets pretty ridiculous in the sixth and seventh seasons. More on that in later reviews. The solution in this episode, meanwhile, is also vintage TOS. Riker, as Kirk, tells the portal some enlightened human ideas, impresses him and then shows mercy. I’m not saying that’s a particularly bad approach, but it wasn’t particularly well done here — and it certainly isn’t in the stylings of TNG at its best. The informal attitude on the bridge and among characters is strange here, too. The attempts at witty dialog are pretty bad. It’s clear that the writers were still getting their sea (space?) legs. There’s also something odd about the scene where Riker materializes on the planet without the rest of the away team. It’s a really dull scene where he walks around looking for everyone (“Annnyybodddyyyy? !”), eventually finding Geordi and Data. What’s also odd is the way Riker asks who the Ferengi are before they attack. I guess he wouldn’t know their names — but wouldn’t he know that they’re the Ferengi away team? I’ve always wondered if the idea when the scene was shot was for it to begin the episode. Much of first-season TNG was re-written on the fly, so maybe that scene was filmed and then the scenes on the Enterprise leading up to it were added. Even if it’s not the case, the early stuff on the planet is pretty weak. Oh, and it’s a small thing, but this is the first time we see the inconsistent treatment of gold in second-generation Trek. The Ferengi take communicators off several members of the away team and make comments about their worth. In later episodes, we learn that gold — on its own — is somewhat worthless, but that gold-pressed latinum is a major galactic currency. The matter is pretty inconsistent even on DS9, where the presence of Quark brings latinum into the conversation like 20 times an episode. This episode, like “The Savage Curtain”, is another that we don’t really recommend for quality — but still is sort of essential viewing. The Ferengi are a major race in Trek going forward, even if their standing changes a lot over the years. 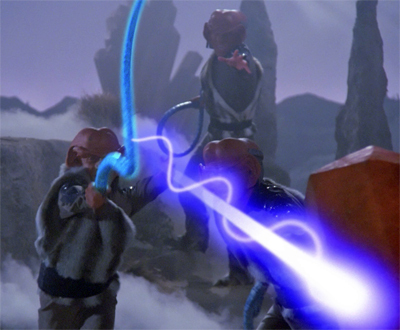 And the Ferengi whip weapons are pretty cool in a retro sort of way. Arguably, there are just two other episodes of TNG where the Ferengi are villains in the classic Klingon/Romulan sense — “The Battle” later in the first season and “Peak Performance” in season two (and perhaps “Bloodlines” in season seven). Mostly, they’re more like conniving cheats, like in “The Price,” “The Perfect Mate” or “Captain’s Holiday.” That change probably made a lot of sense, as taking the Ferengi seriously was never very easy. But why the creators didn’t simply choose to move on from the Ferengi — like, never show them again — is perplexing. Episodes of Ferengi mischief made some sense on DS9 with Quark and his antics. But inserting them into Voyager and (especially) Enterprise? It’s almost as if the creators couldn’t believe that the Ferengi weren’t well-received, so they kept going back to the well. Holodecks and the people who recreate in them — even though the damn things are 24th-century death traps.